Design ideas for a contemporary living room in Perth. 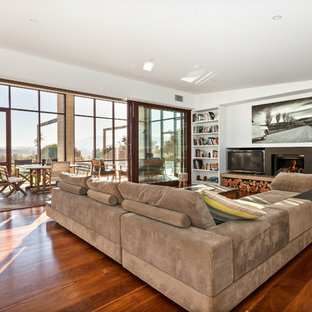 This is an example of a contemporary living room in Other with white walls, medium hardwood floors, a standard fireplace, a freestanding tv and brown floor. Inspiration for a scandinavian kitchen/dining combo in Melbourne with white walls, light hardwood floors and beige floor. 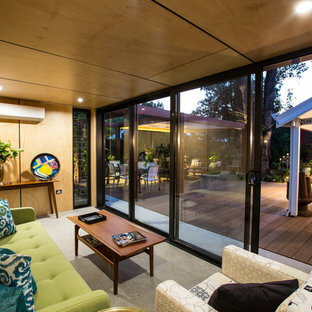 Design ideas for a mid-sized contemporary backyard deck in Sydney with an awning. 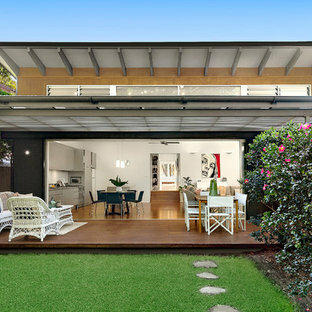 Photo of a contemporary side yard deck in Gold Coast - Tweed with a pergola. 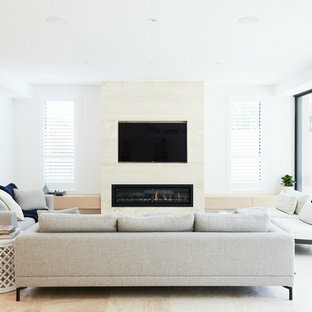 Photo of a contemporary living room in Sydney with white walls, medium hardwood floors and a standard fireplace. Inspiration for a contemporary living room in Sydney with white walls, a ribbon fireplace and a wall-mounted tv. This is an example of a contemporary kitchen in Sydney with an undermount sink, flat-panel cabinets, white cabinets, white splashback, stone slab splashback, white appliances, light hardwood floors, an island, beige floor and white benchtop. 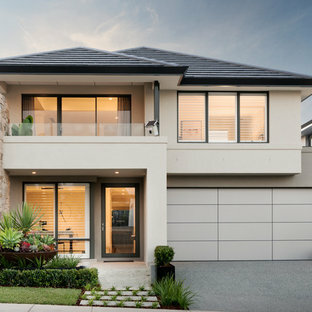 Photo of a contemporary rectangular pool in Sunshine Coast. Photo of a mid-sized industrial open concept living room in Sunshine Coast with concrete floors, a wood stove, a wall-mounted tv, white walls and grey floor. The winter garden to this bedroom provides the amenity of a balcony with sunshine in the winter and shading in the summer, and the louvre windows over the bedhead, allow the summer breezes through. Dining room filled with light and air thanks to full height, doors and windows. 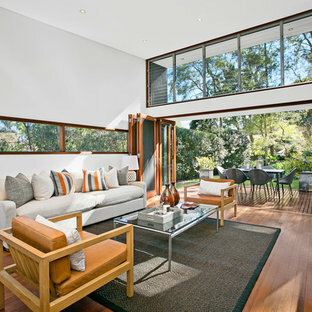 Windows wrap around the room, concealing steel posts, giving the feeling of openness. 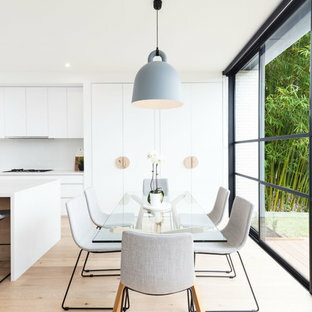 Design ideas for a contemporary open plan dining in Melbourne. Contemporary open concept living room in Sydney with beige walls, dark hardwood floors, a wall-mounted tv and brown floor.